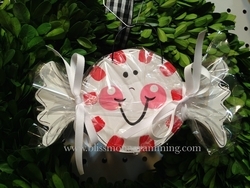 Our handpainted, personalized Candy ornament is approximately 5" x 6" in size. Made of light wood, it's adorned with ribbon and wrapped in cellophane. NOTE: This is a set of two ornaments and they do not get personalized!